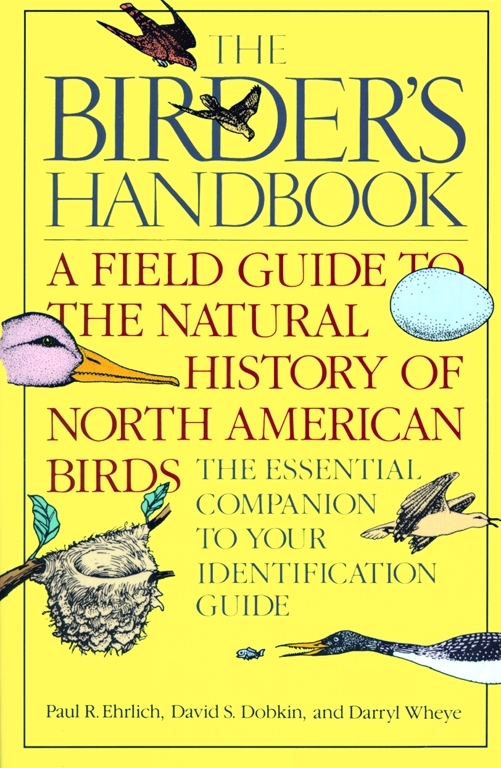 This is the most complete and authoritative reference book about the birds of North America—up to date and in field-guide format. * Food preferences and foraging habits. You will also find information about displays and mating, wintering, conservation status, and much more. In addition, The Birder's Handbook contains some 250 short essays covering all aspects of avian natural history. How often have you come across a bird on a spring morning and stood motionless in an effort to determine what it was doing; to see whether it was near its nest, and if so, what kind of nest it built, or to see why it was holding its tail in an unusual position? Have you wondered what it ate, how many mates it had, how many eggs would occupy its nest, how long it would take them to hatch, or how helpless its hatchlings would be? While there are excellent field guides to help identify that bird, none provide comprehensive information on what it is doing, and why. This field guide takes up where the others leave off -- that is once you have identified a bird. First, you can refer to an up-to-date condensed description of the biology of the species you have in view, and then you can read two or three brief essays which expand on that information and fit your bird into "the big picture" of avian ecology, behavior, and evolution. As you become familiar with this book's format, you will find that it also serves as a guide to what is not known about the biology of North American birds. We have indicated where, by making careful observations, you can contribute to the science of ornithology (see "Observing and Recording Bird Biology," p.XXVII). The Birder's Handbook: A Field Guide to the Natural History of North American Birds includes all bird species (some 650 of them) known to nest regularly on the continent, north of the Mexican border (with the exception of some exotic species that have escaped from captivity) and all the now-extinct birds known to have nested here since the arrival of Europeans. Just as identification guides often present text on left-hand pages and illustrations on right-hand pages, this guide puts facing pages to different uses. Short synopses, called "species treatments," describing the biology of individual species are on left-hand pages of the main section of the book. The species are arranged in approximately the same order found in the second edition of the National Geographic Society's Field Guide to the Birds of North America (1987), the most recent standard identification guide at this writing and the one that follows most closely the sequence of species in the latest (1983, 1985, 1987) revision of and supplements to the Checklist of North American Birds produced by the American Ornithologists' Union (AOU). At the end of each species treatment you will find a list of essays (and the page number on which each starts) giving especially pertinent background material, followed by several references in the bibliography (p. 672) which provide entry to the detailed literature on the species. The essays are presented on the right-hand pages facing these species treatments. They vary in length and cover important and interesting biological topics -- how flamingos feed, how different species of warblers divide hunting areas in conifer trees, how species are formed, how raptors can be conserved, why shorebirds sometimes stand on one foot, why birds rub themselves with ants, how migrating birds find their way, why the Passenger Pigeon became extinct, what determines how often hummingbirds feed, and what duck display mean, just to name a few of the numerous topics addressed. Also included is a series of biographical sketches of bird biologists who have made important contributions to understanding our birds, and some notes on the origins and meanings of North American bird names. To the degree possible, these essays are placed opposite species to which they are most relevant. We have attempted in this small volume to condense the information that otherwise can be found only in a library of ornithological books and journals. The only other book that has attempted to present roughly equivalent coverage is now hopelessly out of date and weighs eight pounds. To achieve compactness we have had to use a highly condensed format for the presentation of data on the species treated. It therefore is important to read the next section, "How to Use This Book," so that the information will be readily accessible to you when birding. Paul R. Ehrlich is Bing Professor of Population Studies and Professor of Biology at Stanford University, and a member of the National Academy of Sciences. He is the author of over 400 scientific articles and more than 20 books, including The Population Bomb, Extinction, and The Machinery of Nature. David S. Dobkin is the author of The Birder's Handbook. Darryl Wheye is the author of The Birder's Handbook. Susan Roney Drennan Editor, American Birds A dizzyingly competent, extraordinarily readable, impeccably comprehensive and marvelously educational feat! Certainly mandatory reading for everyone even remotely curious about the birds they watch. Mercedes S. Foster Research Zoologist and Curator of Birds, U.S. Fish and Wildlife Service The Birder's Handbook is a gold mine...that will greatly enhance the joys of watching birds. David S. Wilcove Ecologist, The Wilderness Society Field guides will help you to recognize birds. This book will help you to understand them....This book should be required reading for all birders, naturalists, and conservationists. Thomas E. Lovejoy Smithsonian Institution Anyone who owns a field guide to the identification of North American birds will want The Birder's Handbook as a companion volume.